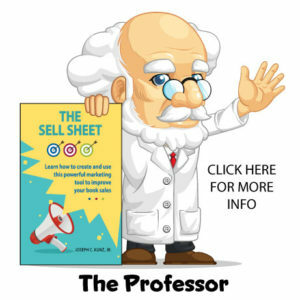 ← What Makes A Great Sell Sheet? 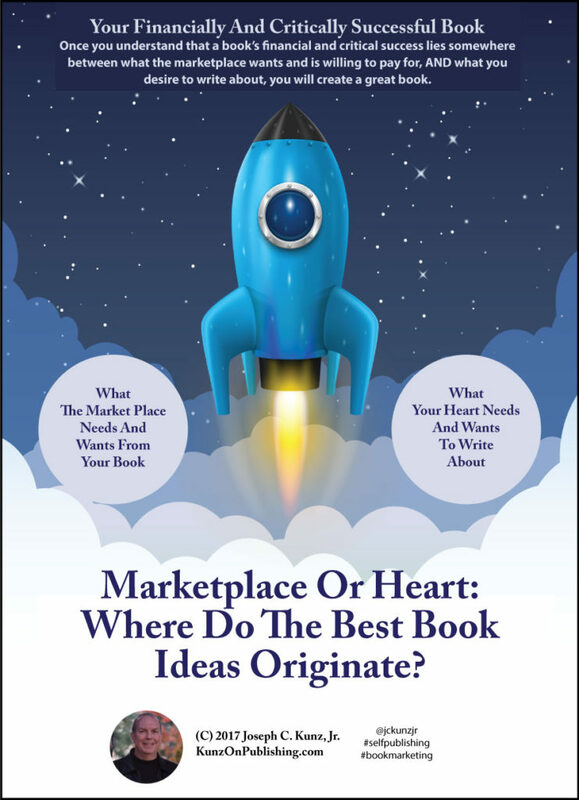 Do The Best Book Ideas Originate In The Marketplace Or In The Heart Of The Author? Posted on July 21, 2016 by Joseph C. Kunz, Jr. 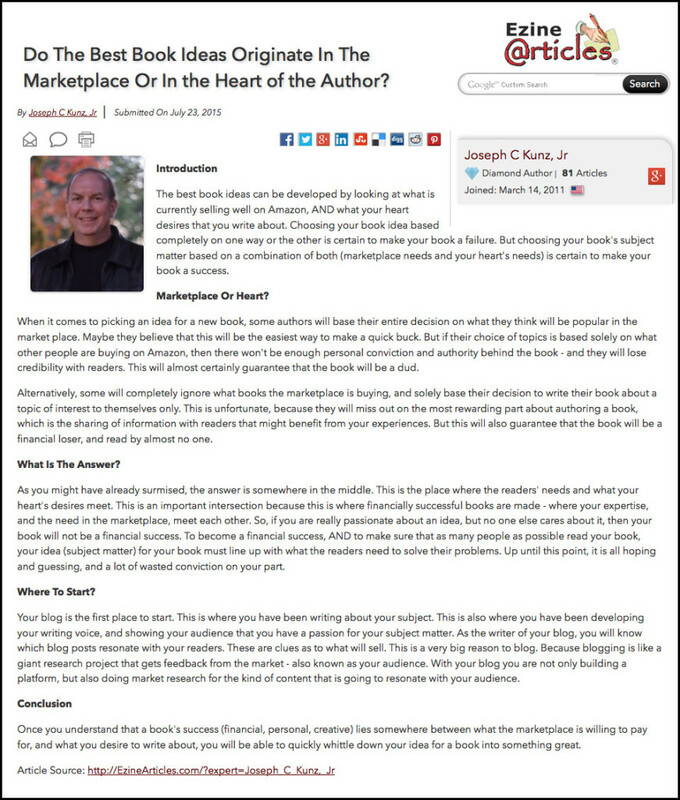 Marketplace Or Heart: Where Do The Best Book Ideas Originate? This is one of the initial big questions would-be authors ask when they finally decide that they want to write their first book. The answer is not as elusive as many might believe. And dealing with this question early in the writing process will help ensure your book will achieve some measure of success. Here is a short discussion to help you figure out where to find the answer. 1. 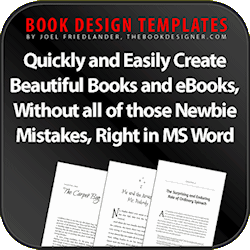 You will learn why and where the best book ideas originate from. 2. You will learn the difference between what the market wants, and what you want. 3. You will learn where and how to find and develop your book ideas that have a good chance of becoming a success. This is one of the initial big questions would-be authors ask when they finally decide that they want to write their first book. The answer is not as elusive as many might believe. The best book ideas can be developed by looking at what is currently selling well on Amazon, AND matching that with what your heart desires to write about. Choosing your book idea based completely on one way or the other is certain to make your book a failure. But choosing your book’s subject matter based on a combination of both (marketplace needs and your heart’s needs) is certain to make your book a success. 1. Marketplace: When it comes to picking an idea for a new book, some authors will base their entire decision on what they think will be popular in the market place. Maybe they believe that this will be the easiest way to make a quick buck. But if their choice of topics is based solely on what other people are buying on Amazon, then there won’t be enough personal conviction and authority behind the book – and you and the book will lose credibility with readers. This will almost certainly guarantee that the book will be a dud. 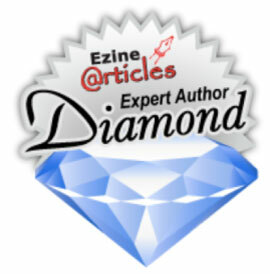 Please include attribution to https://kunzonpublishing.com with this graphic. 2. Heart: Alternatively, some will completely ignore what books the marketplace is buying, and solely base their decision to write their book about a topic of interest to themselves only. 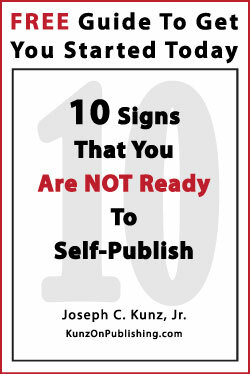 This is unfortunate, because they will miss out on the most rewarding part about authoring a book, which is the sharing of information with readers that might benefit from your experiences. But this will also guarantee that the book will be a financial loser, and read by almost no one. 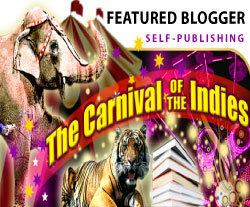 Ezine Articles – Do The Best Book Ideas Originate In The Marketplace Or In The Heart Of The Author? B. What Is The Answer? In the middle: As you might have already surmised, the answer is somewhere in the middle. This intersection, somewhere in the middle, is the place where the readers’ needs and what your heart desires meet each other. 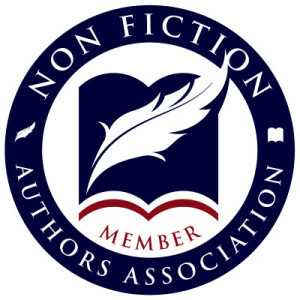 This is an important spot because this is where financially successful books are made – where your expertise, and the need in the marketplace, meet each other. So, if you are really passionate about an idea, but no one else cares about it, then your book will not be a financial success. To become a financial success, AND to make sure that as many people as possible read your book, your idea (subject matter) for your book must line up with what the readers need to solve their problems. Up until this point, it is all hoping and guessing, and a lot of wasted conviction on your part. 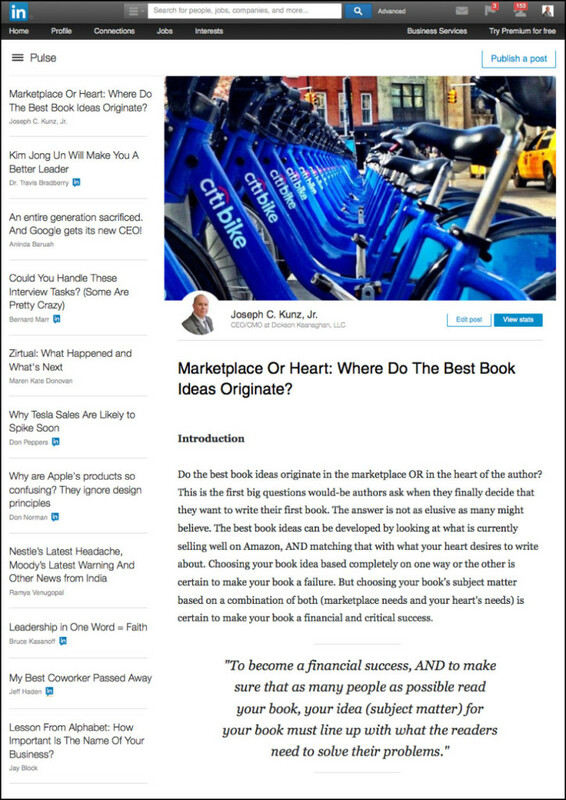 Linkedin – Marketplace Or Heart: Where Do The Best Book ideas Originate? 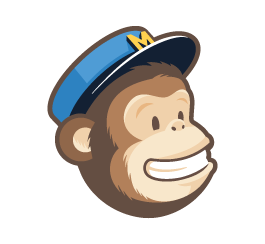 Blog: Your blog is the first place to start. This is where you have been writing about your subject for the last year or two. This is also where you have been developing your writing voice, and showing your audience that you have a passion for your subject matter. As the writer of your blog, you will know which blog posts resonate with your readers. These are clues as to what will sell. This is a very big reason to blog. Because blogging is like a giant research project that gets feedback from the market – also known as your audience. With your blog you are not only building a platform, but also doing market research for the kind of content that is going to resonate with your audience. Once you understand that a book’s financial, personal, and creative success lies somewhere between what the marketplace wants and is willing to pay for, and what you desire to write about, you will be able to quickly whittle down your idea for a successful book. This should also give you comfort in knowing that your book will be well positioned to gain some measure of success. This will also make it much easier for you to find the mental energy that you will need in order to spend the next 12 months writing your book. 1. 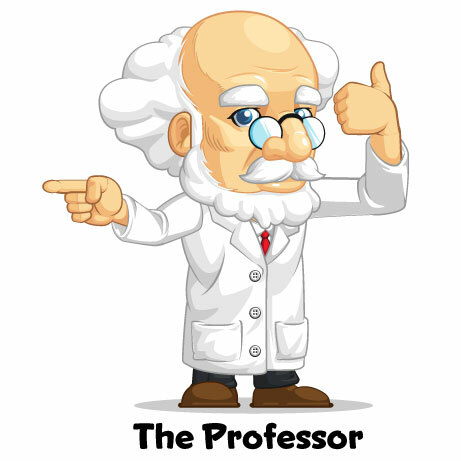 Did you do some research on Amazon about what is selling in your particular topic of interest, or niche? What did you discover? 2. What methods, or thought process, did you use to narrow down the topic for your book? 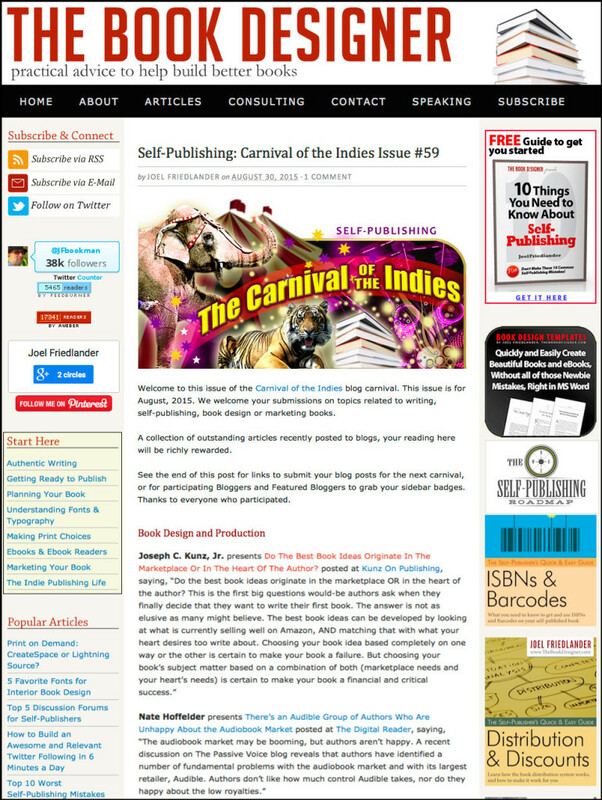 This entry was posted in Author Platform, Blogging, Book Marketing, Carnival Of The Indies, Credibility, Feedback, Market Research, Podcast and tagged Audience, Audience Feedback, Author Platform, Blogging, Book Publishing, Content, Ebook, Feedback, Market Research, Market Testing, Marketplace, Podcast, Product Development, Self-Publishing, Target Audience. Bookmark the permalink.